I am one of those people who don't believe in the “No white before Memorial Day” rule. Personally, I think the rule is old and outdated. White denim has arrived as a year-round staple and is the perfect way to brighten up your wardrobe. Spring is the perfect season for white denim - keeping everything looking crisp and clean. Don't you agree? Do you follow the "No white before Memorial Day” rule? I completely agree! I don't like rules like that. I say you can wear white whenever! Love this look. I wore white jeans today and my boss called me out on it...not because I'm wearing it before Memorial Day, but because I'm wearing it in cold/rainy 40 degree weather that seems more like fall than spring. 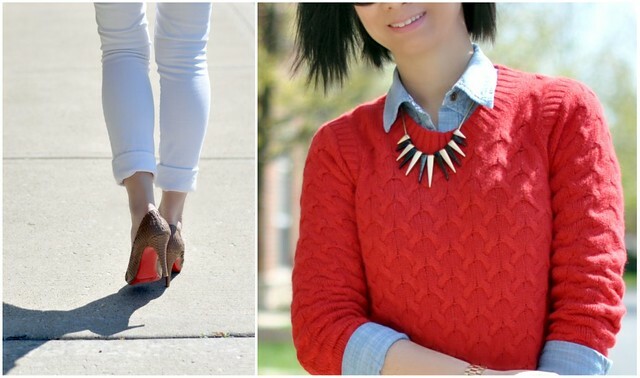 I love the edginess that the necklace brings to this outfit! Definitely agree! I love white all year round ;) I'm still crushing on your haircut by the way...super chic! I have always wondered who came/come up with these fashion "rules" and, why do I/we have to follow them. Men wear white shirts 365 days of the year. My fashion rules are does it fit, is it comfortable, and do I like it (not necessarily in that order). Love the outfit. Need a pair of white demin! Looking patriotic, Syd! This is the debut of the Tillary and Ron Rons, right? Love both pieces! Those white pants fit you like a glove and I love the all American styling. I've been wearing my white pants since the winter and I've already brought out my white shorts :) Have a great weekend, Sydney! Gorgeous and love how youve paired it! I love the pairing. You look so chic! Yes, the white rule is outdated! You look awesome, love the bag! You look gorgeous in write and white. Love the Tillary tote on you. I love this look! You look fabulous! Red and white always looks great together. I don't believe in the no white before Memorial Day rule either. Love the red, white and blue look! That edgy necklace is so fab, loved it always! I have a major crush on that J. Crew Tillary tote! Sydney, you look beautiful, as always! i've been wanting this tote! you look amazing! 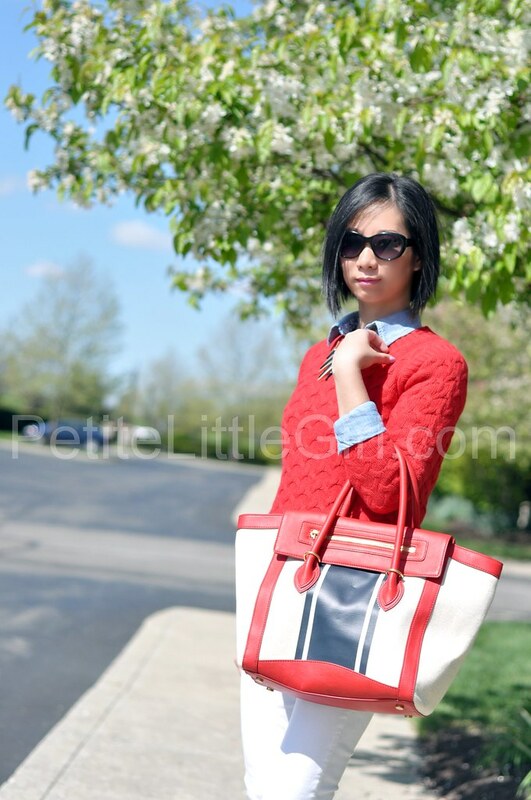 Great outfit and love the bag!